Dig out the underlying meaning before you decide. There is so much advice out there for knitters of every skill level. No matter what project you are working on, some helpful knitter is ready and waiting to give you advice on how to do it better. (Myself included!) But how do you evaluate this advice? How can you know if it's right for you? Much less true? I started thinking about this when a knitter asked one of the main Ravelry boards about the advice to "knit a top-down sweater, so that you can try it on as you go." Her question was, does this even work? Because if you are knitting in a natural fiber, most of them will change size slightly when they are washed and blocked. 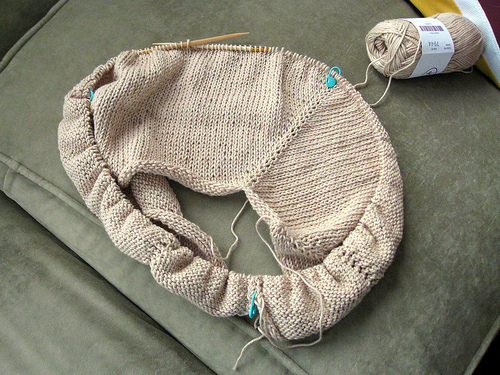 How disappointing it would be to knit a top-down sweater, trying it on every few inches to check the fit, only to have the whole thing swell three sizes the first time you wash it. And then there is the issue of weight. Depending on the fiber you use, the longer and larger your sweater, the more likely it will be to stretch itself out as you wear it. Use your own measurements as a guide, and you could find yourself donning a sweater in the morning, and taking off a mini-dress at night. My own puzzlement as a new knitter was over similar advice for toe-up socks. "You can try them on as you go." I found this advice utterly confounding. You can try on top-down socks, too! I have done it many times. What both of these bits of advice have in common is an assumption that you cannot, or will not, be persuaded to A) knit a swatch, and B) do some basic math. When you think about it, that's a pretty insulting assumption. The math to calculate your gauge is pretty simple. If you are getting 8 stitches to the inch, and you need socks that are 6 inches around, then you need to increase to 48 stitches (8x6). Is it really that much easier to try it on as you go, and just guess at it? The distortion of the needles alone will throw you off. When faced with a bit of knitterly advice, MY advice is to ask yourself, "What are the assumptions behind this advice?" Some knitting advice is designed to provide better results. Other items of knitting advice are designed to save you time, or streamline your knitting process. You don't have to take everyone's advice, but it's definitely worth thinking over before you decide either way.